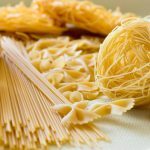 Most of you are probably aware of the fact that being a celebrity isn’t all sunshine and rainbows; much too often the rich and famous are being judged, criticized, accused, mocked and even insulted. The burden of being a public figure is a heavy one, and the stars react differently; some take it hard and some couldn’t care less, which is the better way to react to random people’s nasty comments and deeds. Naturally, most of the trolling and shaming regards the personal lives of the celebs, as well as their appearance. People seem to have constant need to find and point out everyone else’s flaws, instead of concentrating on their own. This was exactly the case with the recent comment that a random troll fired at Snooki. And as you could probably imagine, she was able to shut him down instantly. We always find pleasure of seeing people get what they deserve; Snooki delivered exactly that in her own style. Nicole Elizabeth LaValle, known mostly by her nickname Snooki, born in Chile and raised in New Jersey by her foster parents, became widely famous after her appearance as a cast member of the Jersey Shore reality show produced by MTV. Except for being a reality star, Snooki is also a dancer, author and even a professional wrestler. After she literally stole the show in Jersey Shore, she became grew her popularity by appearing at The Ellen DeGeneres Show, the Late Show with David Letterman, and other similar shows. She was also a guest host for WWE Raw, and later she even participated at the WrestleMania XXVII competition. As you could imagine, all the attention of becoming a public figure brought her a lot of love from the fans, but there was a dose of negativity and hate as well. 1. Snooki posted a photo recently in which she is smiling and striking a pose in front of the official poster for Jersey Shore: Family Vacation. There is no mistake here; the cast members of Jersey Shore are reuniting, except for Sammi. We are sure that it will be the same massive pleasure to watch these guys on TV like it used to be. 2. However, there was someone who obviously had nothing better to do than posting rude comments. 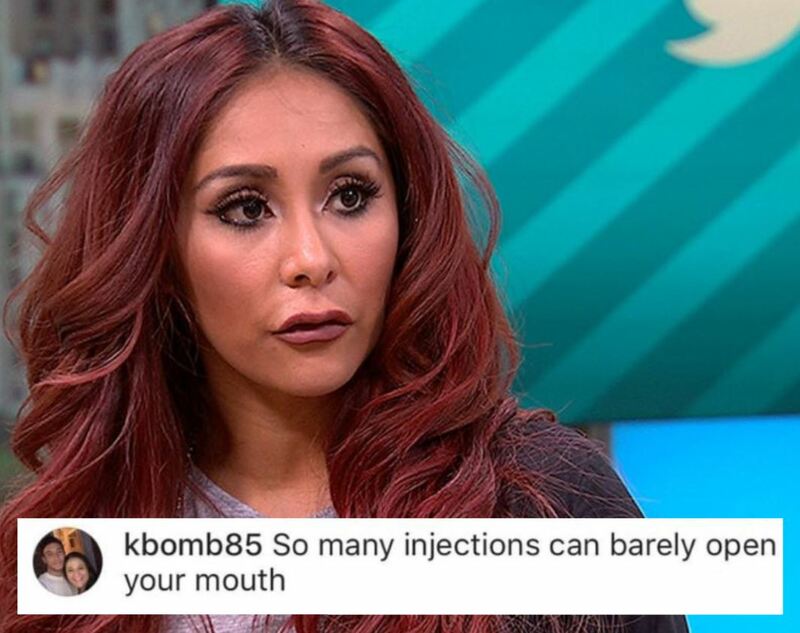 After that very inappropriate comment, most of her fans must have been furious; Snooki has always been open about this topic and she has spoken about the lip injections she underwent. What is more important, she does not care at all what everyone else thinks about her decision, which probably makes her very happy. 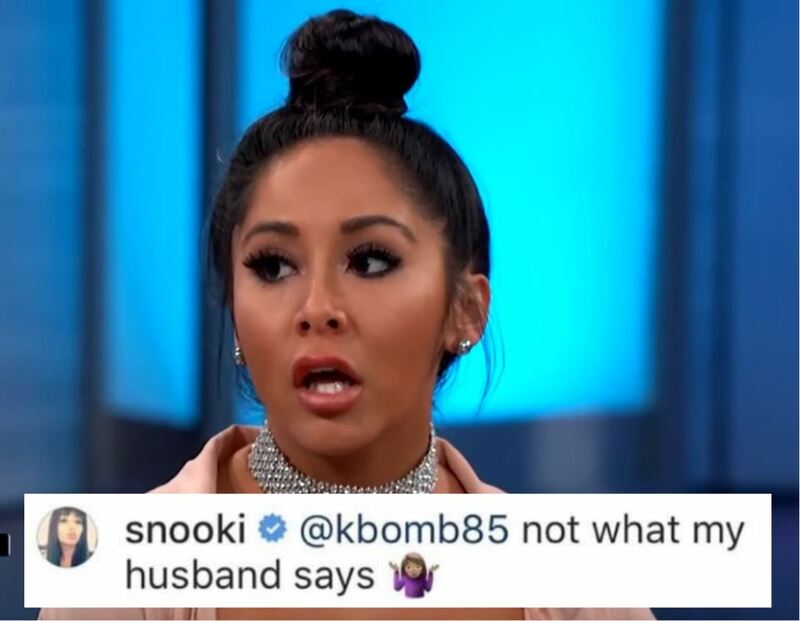 Snooki fired back in the best way she could, and she totally shut down the troll with her extremely honest and sarcastic reply. There was nothing more that could be said on the topic after that. And what is also important is that her husband is probably the real expert on this issue. This is how you deal with the Internet trolls with style and attitude. Haters will be out there all the time, because it’s just a part of the game. But as long as you know who you are and stand your ground, there isn’t a comment in the world that could bring you down. If you ever experience the same kind of trolling, now you know how to treat this kind of people; you could always win and take them down Snookie style.